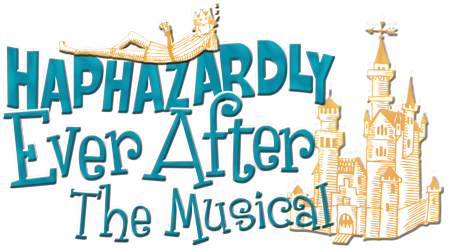 The musical fun in this original fractured fairy tale farce is equal only to its magical appeal! The mean Princess Cinnamon, the not-so-bright Princess Peppermint, the vain Prince Hairgel, and Prince Slacker are obnoxious, bratty adult children who do not live up to their royal titles — and they still live at home! The king and queen try everything to help their children grow up and move out, but nothing seems to work. After hiring a therapist, bringing in teachers, and even trying to marry off their children, the king and queen are ready for a happily-ever-after that doesn’t involve their children living at home. They call upon a fairy godmother to help quiet the castle. But who knew hiring a fairy godmother came at such a ridiculous price? Read more...And the permits required are outrageous! The king and queen decide to create a do-it-yourself fairy tale... and chaos ensues! Nothing goes as planned and musical, comical, royal chaos ensues. But despite the king and queen’s DIY failure, the princes and princesses just might have been changed for the better. This magical musical is guaranteed to bring a smile to your face.